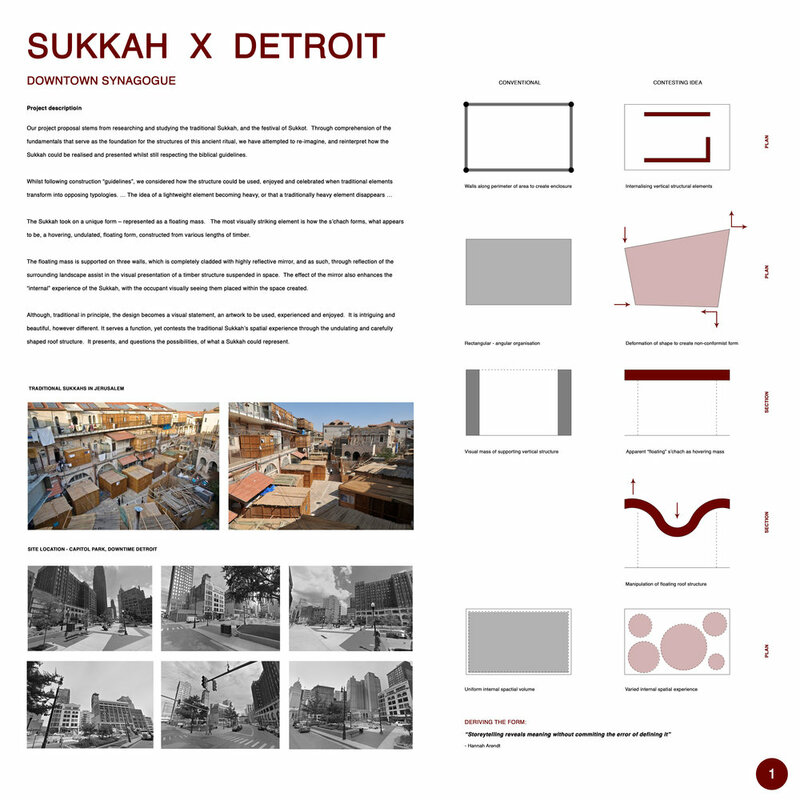 Our project proposal stems from researching and studying the traditional Sukkah, and the festival of Sukkot. Through comprehension of the fundamentals that serve as the foundation for the structures of this ancient ritual, we have attempted to re-imagine, and reinterpret how the Sukkah could be realised and presented whilst still respecting the biblical guidelines. Whilst following construction “guidelines”, we considered how the structure could be celebrated when traditional elements transform into opposing typologies - the idea of a lightweight element becoming heavy, or that a traditionally heavy element disappears. The Sukkah took on a unique form – represented as a floating mass. The most visually striking element is how the s’chach forms, what appears to be, a hovering, undulated, floating form, constructed from various lengths of timber. The floating mass is supported on three walls, which is completely cladded with highly reflective mirror, and as such, through reflection of the surrounding landscape assist in the visual presentation of a timber structure suspended in space. The effect of the mirror also enhances the “internal” experience of the Sukkah, with the occupant visually seeing them placed within the space created. Although, traditional in principle, the design becomes a visual statement, an artwork to be used, experienced and enjoyed. It is intriguing and beautiful. 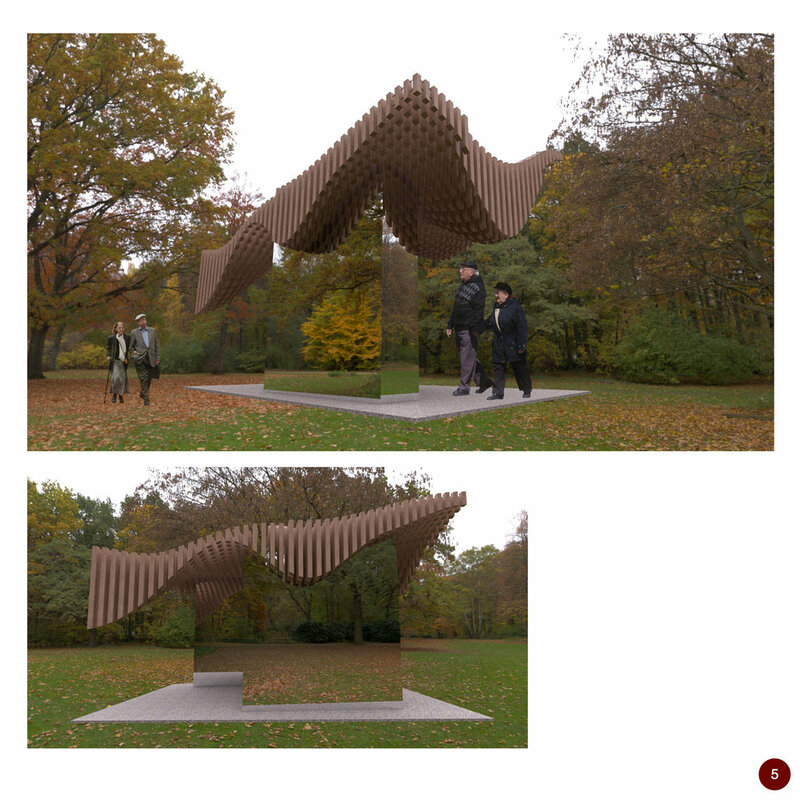 It serves a function, yet contests the traditional Sukkah’s spatial experience.